You are here: Home 2014 December Need Cisco RPS 2300 for Cisco Catalyst 2960-X/2960-S and Cisco 3750 Series? 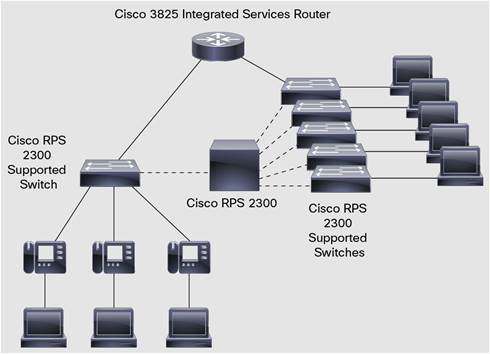 Do you need the Cisco RPS 2300 for your Cisco 2960-X, or 2960-S switches? How much do you know about the Cisco RPS 2300? What’s the main feature of Cisco RPS 2300? If you have these questions, you should read this article that contains the main points of Cisco RPS 2300. Cisco RPS 2300, the full name is CiscoRedundant Power System 2300, delivers power supply redundancy and resiliency for a variety of power requirements, including Power over Ethernet (PoE). The more important is that RPS 2300 helps ensure uninterrupted operation and protection against device power supply failures by providing seamless failover for Cisco switches such as the Cisco Catalyst 2960-X, 2960-S, 2960-Plus, 2960, 3750-E Series Switches and Cisco routers such as the Cisco 3825 Integrated Services Routers. It increases availability for converged data, voice, and video networks. 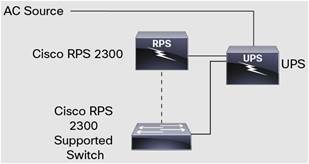 Flexibility and High Availability: The Cisco RPS 2300 can provide complete internal power supply redundancy for up to two attached networking devices. It has two power supply bays and can accept 1150W AC or 750W AC power supply modules. These power supply modules are also used with Cisco Catalyst 2960-X, 2960-Plus, 2960-S, 2960, 3750-E, 3560-E Series and Meraki Switches. With two 1150W AC power supply modules, the Cisco RPS 2300 can fully back up two 48-port switches that are delivering 15.4W of PoE on all ports. The Cisco RPS 2300 also has a replaceable fan module. The Cisco RPS 2300 can address the first two issues. The last issue requires an uninterruptible power supply (UPS). With a single AC circuit, regardless of whether it is from a UPS, the RPS provides protection against a power supply failure for up to two attached devices. With a second circuit (Figure 4), again regardless of whether it is from a UPS, the RPS provides protection not only from an internal power supply failure but also a failure of the primary AC source. For maximum availability, the RPS should always be used in conjunction with a UPS (Figure 5). Modular power supplies and a fan module offer enhanced availability. Less than 60-µs failover capability prevents switch reboot after an internal switch power failure. When backed up by a Cisco RPS 2300, a Cisco Catalyst 2960-X, 2960-S, 3750-E, or 3560-E Series Switch is capable of reverting back to its own power supply without rebooting. All other devices may reboot when reverting back to their own power supplies. The system supports traditional data-only Ethernet switches as well as PoE switches. The system is capable of providing AC source backup when separate circuits are used for the RPS and attached devices. Modular power supplies offer configuration flexibility. The system, or individual RPS ports, can be remotely placed in active or standby mode. The system offers configurable RPS port priorities and failover policy. LEDs on front panel and power supplies indicate system and power status. Innovative power architecture delivers a cost-effective RPS that can connect up to six devices and can actively back-up up to two devices simultaneously, thereby reducing the redundant power cost per device. The system supports a wide variety of Cisco Catalyst fixed configuration switches and Cisco Integrated Services Routers. The Cisco RPS 2300 can operate with one or two power supplies. If two power supplies are installed, they must be of the same type. Table 1 shows the number of switches that can be simultaneously backed up by the Cisco RPS 2300 for its different configurations.